Events and Event Handling in wxPython docs. Binding Multiple Widgets to the Same Handler from the Python Library Blog. The article "self.Bind vs. self.button.Bind" from wxPyWiki. Use Arbitrary WX Objects As A Column In A wx.ListCtrl on StackOverflow. wx.FileDialog And "Recently Opened Files" On Ubuntu on StackOverflow. Model View Presenter in wxPython Tutorial on wxPyWiki. wxGlade: a GUI builder for wxWidgets. wxPython is the Python binding to the C++ multi-platform GUI library wxWidgets. Inherit from wx.Frame. In the frame constructor you create all the components that are going to go onto the window. Give it a NULL parent to make it the main window. Add a button by adding the following into your Frame/ Panel (Note: really you should add everything to a panel or some other container and not directly to the Frame to render correctly on all platforms... but for the sake of brevity in the examples I do). Eek! There is a problem... the Python script has rendered all the buttons on top of eachother. We could place them using absolute coordinates manually, but it is much easier to get wxWidgets to organise them for us. Now, at least, our buttons are not on top of each other: they are properly rendered and have a reasonable size. As each button is Add()'ed to the sizer it is placed horizontally to the right of the last added component. This is because we specified wx.HORIZONTAL. The other layout option is wx.VERTICAL. The image above shows a Python wxWidgets (pyWidgets) window that has been expanded a little. What we see is that the buttons stay in the same location and do not scale with our window, which may be exactly what we want. But what if we'd like then to fill the window? When we Add() an element to a sizer we can tell the sizer to automatically size the element to fill up the space available using the wx.EXPAND flag. In the case of a wx.BoxSizer, the sizer will expand as far as possible in all directions. It will then give you the option as to which directions the contained elements are expanded. The next parameter to Add() is the proportion of the space in the wx.HORIZONTAL or wx.VERTICAL direction you wish the element to expand. The proportion is an integer number. Zero means don't resize and any other number is the proportion as a fraction of the total proportions of all elements in the sizer, that the element size will be. For example, if you add two components, A and B, with proportions 1 and 2 respectively, element A will take up 1/3 of the space and element B will take up 2/3 of the space in the sizer's direction. Now when the window is expanded we will see the following. As you would expect, the buttons expand horizontally to fill the space available and the first button takes up 1/3 of the space and the second button 2/3. If we changed our example to use a wx.BoxSizer(wx.VERTICAL) we would see the opposite. The elements will fill the vertical direction and keep a constant size in the horizontal direction? Using the above, as we expand the window, we will now see that the buttons expand in both the horizontal and vertical directions. So, the wx.EXPAND tag tells a sizer to expand its components in all directions. To size with a horizontal box sizer we get automatic horizontal expansion. To fill the remaining space we then need to use the wx.EXPAND flag. The same applies for a vertical box sizer. We get the vertical expansion "for free" and use the expand flag for the rest of the space. So, we've seen statically placed buttons that don't move when the window expands and buttons that expand with the window. But what if we want a bit of padding between the buttons. There are two things we can do. Add in a static amount of space around the object. This space is static because it will not change with the window size. Add in a spacing element that will resize in the same way that an object would and therefore is proportional to window size. If you wanted a spacer of a fixed width or height in pixels you could also investigate sizer.AddSpacer(size). This spacer will not expand relative to window size: it will keep a constant size. Border is the border of padding that is to be applied to the component. Which of the top, botton, left and right borders are used, or padded, is dictated by the flag option. Flag is used, as said, partly to specify which borders will have the padding added to them and which will be left alone. This is done using the following flags: wx.TOP, wx.BOTTOM, wx.LEFT, wx.RIGHT, wx.ALL. Flag also is used to dicate how the element is aligned in it's box: wx.ALIGN_CENTER, wx.ALIGN_LEFT, wx.ALIGN_RIGHT, wx.ALIGN_TOP, wx.ALIGN_BOTTOM. 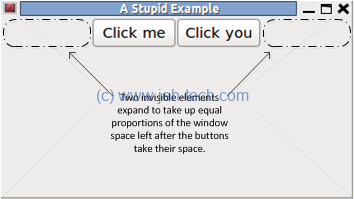 The function OnBtnClick() has been created to handle button clicks. It receives two objects. The first is the standard self reference to this class instance. The second is the event object which describes the event. The event object can be used to get the control that fired the event using GetEventObject(). Once you have the wxWidget that fired the event, you can call it's function GetId() to get the control's ID. This can then be used to compare the event-source ID against all the possible widget IDs you are handling. To handle the click event you must register either the button or one of its parent windows as a handler for the EVT_BUTTON type of event. The line self._btn1.Bind(...) in the above example registers the button "window" as handling this event. When the event fires, the OnBtnClick() function will be called. 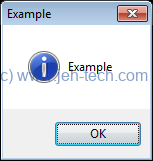 In the above example an event handler is registered for the button and for the frame (the button's parent container). If the event.Skip() function is left commented out, when you click the button, only the message box reading "Button intercepted" will display. If you uncomment the command you will see first the "Button intercepted" message box and then the "You pressed..." message box. Can have image or image and text. For text entry you can use a wx.TextCtrl widget. The standard wx.ProgressDialog is really good and I only learnt about it after building my own. I wanted to present messages in my progress dialog so this was my own little effort at constructing one. It is a pubsub aware dialog that receives progress and termination messages (the thread must send at least the latter). 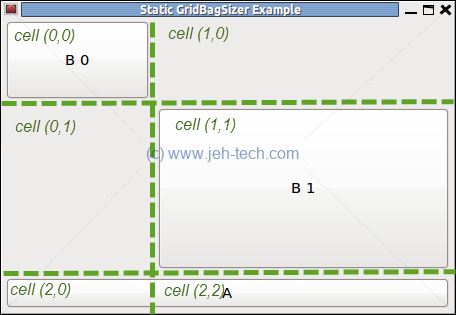 Cells can be seperated with margins (wx.GridBagSizer(hgap=5, vgap=5)) and can have padding (GridBagSizer.Add(..., border=<number>)). 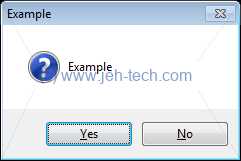 Easy to show and can be yes/no, ok/cancel kinds. You can determine which button has the initial, default, focus by or'ing the the styles wx.OK_DEFAULT, wx.CANCEL_DEFAULT, wx.NO_DEFAULT or wx.YES_DEFAULT. You can change the icon displayed in the message box using the following styles: wx.ICON_EXCLAMATION, wx.ICON_ERROR, wx.ICON_HAND, wx.ICON_QUESTION, or wx.ICON_INFORMATION (or wx.ICON_AUTH_NEEDED (on later versions of wxPython)). One thing I often want to do is make the dialog remember where you last were if you re-open it. It is important do use the dialog method GetPath(), which returns the full path to the selected file, and not a combination of GetFilename() and GetDirectory(). These no longer work, especially on Ubuntu! In the window that is opening the dialog, I usually have a "protected" instance variable _dirNameChache, initialised to the empty string, that is updated everytime the dialog selects a new file. There are more window styles other than wx.FD_OPEN. The ones I most commonly use are wx.FD_SAVE, which will make it a save not a load dialog. wx.FD_OVERWRITE_PROMPT for save dialog only. 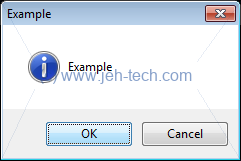 It will make the dialog prompt for a confirmation if a file will be overwritten. FD_FILE_MUST_EXIST to make the load dialog ensure the file exists when it is selected by the user. When trying to force a close of your DIY dialog use the EndModal(<exit code>) function. Don't destroy the dialog. See the wxPython Pub Sub wiki entry. Import the pubsub libraries as follows. The first import puts the module API into the "newer" mode. Note: If you are receiving pub/sub events from another thread and want to update widgets remember to use the wx.CallAfter(func, *args) function: ...wx.CallAfter takes a function and its arguments, and calls the function when the current event handler has exited. It is a safe way of requesting action of a Window from another thread... . The key/value pairs are passed to any subscriber-functions as named parameters. The following is an example using Pub/Sub to create a progress dialog that listens for "progress events" and updates its progress bar and status message when the event is received. WORKER_PROGRESS="some string identifier you like"
Want the ability to drop a file or directory on a control and receive the path to that file or directory? This is how. Based entirely on this wxPython wiki entry, which does into far more detail. It appears that to reset the scrollable region you should use SetVirtualSize() instead of SetScrollBars() as the latter will always reset the window location, so at very least, couldn't be called on a repaint anyway. The former worked for me. SetScrollBars() creates them but then to resize the what the window thinks is the scrollable region you SetVirtualSize(). TODO wxPython and Cairo with PyCairo... look at this Wiki guide. Need to try this out as the wxPython 3.x.x demo has a pyCairo section to it!